Thaalu thoran is made out of Colocasia stem. Have you heard of this one before? I am asking because my friend from Kottayam (my home town) says she has never had this before. You should, if you haven't. 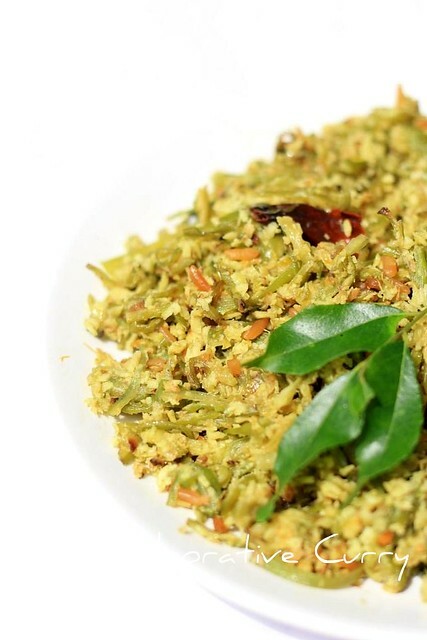 The thaalu and deep friend rice grains together gives this thoran a nice crunchy texture. I hope I could explain the taste better. Everyone at home know how much I like this one. Not so easily available in the US my sweetest granny made sure I had enough. She made up for all the missed times. Oh! she is quite old now and she spoils me. Back to the recipe. It is quite simple. Though rare you can buy the stems in Chinese super markets in the US. Exorbitantly priced when the urge hits I indulge. This used to happen especially when I was carrying my son. Now, you will agree those are times when you can just let go. I have to say this in closing you need no excuses to spend on this one. Once you taste it I guarantee you will go back for more thaalu. 3.Meanwhile grind the coconut and green chillies coarsely. 4.Throw in the chopped stem and coconut mixture along with turmeric and salt into the seasoning and cover to cook on low heat. Stir every 2-3 minutes until it is cooked. This won't take more than 5-6 minutes. 5.Keep the pan open and let all the moisture get absorbed.Serve warm with pulissery or sambar . Thoran looks hearty and thanks for posting the Taro pics from your Dad's garden. Hope you are getting ready for the grand festival. Eat lots of good food and a very Happy Onam to you and your family. Interesting recipe. Must be very tasty too. What a beautiful presentation. Love the Taro leaves pic as well. Very interesting! I have never heard of this before. Thank you for sharing :). Thallu thoran looks delicious. Amma used to make it. I am missing them. 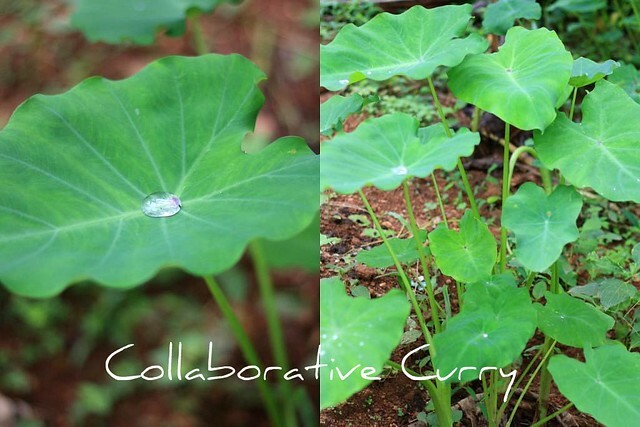 I havent tried curry with stems but taro plant leaves curry is quite popular in my home! Wonderful clicks & a healthy recipe! Nice recipe da..ente MIL undakum, pakshe njan ethuvare try cheythittilla!Will give a try.thx for sharing da. ethukondu ente veetil amma 'chembin thandu olan 'undakum.thoran kazhichittila.adipoli da.Nadan dish oke poratte.Onam evide vare ayi? I'm colocasia-phobic due to it's itchiness. Anyway, love the dish! I like the last photo, awesome. This thoran is new to me, but looks good. That sounds new to me and interesting. wow, lovely recipe, looks delish. This is certainly new to me... lovely i have a new recipe to try!. Thnx for sharing. Great recipe Namitha... Using rice in the seasoning is something I have never heard of before. They must be very healthy! I remember I had some sweet potato leaves, and they were really good. I love anything with taro, thoran looks very delicious..
Great pictures! 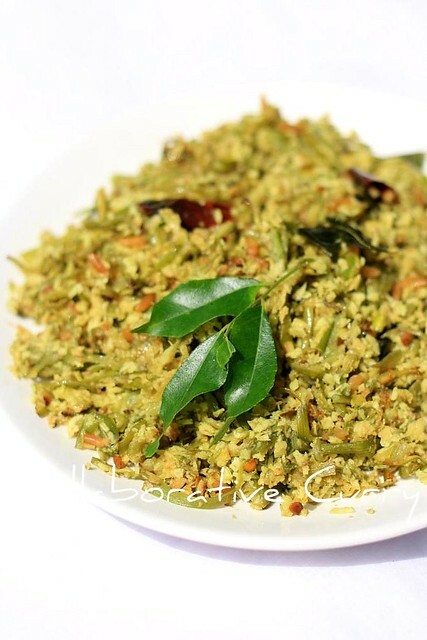 Njangalde ennathe post chena thandu thoran annu :) Njangalde aviduthe onam special thoran annu athu..Pinne ente ammayum thaalu thoran edakkide undakkarundu..Recipe similar annenne thonnunnu..
Nice recipe..me too love this looks yummy..Happy Onam. Thank u and happy onam dear! I've never heard of a taro thoren...great idea though. I bet it was delicious with that coconut. Water on a taro leaf looks so pretty, doesn't it? Very bead-like, or maybe a bit like a pearl. My parents too grew some, here in California. Lovely and a very authentic recipe. Be careful using all kinds of thalu (one from the picture is not suitable for this), what we call as kannan chembu is ok but the other one like chima chembu make itching and reaction. Thank you for this recipe. I just finished cooking n it came out well. I especially liked adding raw rice. It adds a peculiar taste n crunchiness. I added polished black gram seeds too after adding rice. Can't out well.